Very useful software to recover from lost hard drive. all my worry on data lost has gone after I purchased this data recovery software. Recovering lost data from hard was never been so easy.thanks a lot. 7 data recovery software recommend by many user, its one of the best software for recovery. bapok bhalo software data recovery korar jonno. thnak you very much..
thank you saved my life and recovered all recovery…..
Bahut acha software hai, ap ko bht sukriya bhai.. 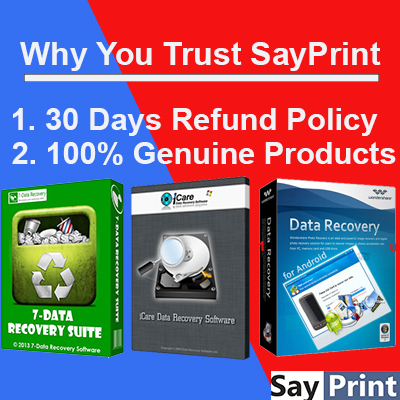 I must say thanks to the sayprint for offering us such a magical software to us which has the inbuilt magical powers for recovering the lost data even from the RAW hard drive. I was not very sure to about this product as I had already experienced many software before it, but after using this software, I am totally amazed. Can’t believe it!!! Thanks sayprint . Saves lots of bugs for recovering MS office deleted files. I really appreciated and definitely share this software among my circle. I have recovered around 50 photos that were deleted mistakenly by my son. You and your software made me very happy since it contained our recent trip pictures. Software is very easy to use.